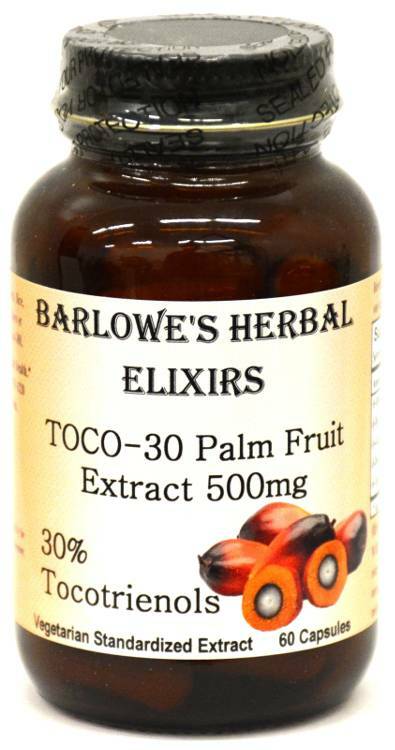 Barlowe's Herbal Elixirs now offers Toco-30 Tocotrienol Palm Fruit Extract - a full spectrum tocotrienol complex which has been encapsulated to make it more convenient to take. Toco-30 is a water soluble powder which results in enhanced bio-availability. It supports optimal hormone production, hair health and a strong cardiovascular system. Bottled in Glass! No Stearates! No Fillers! No Junk! 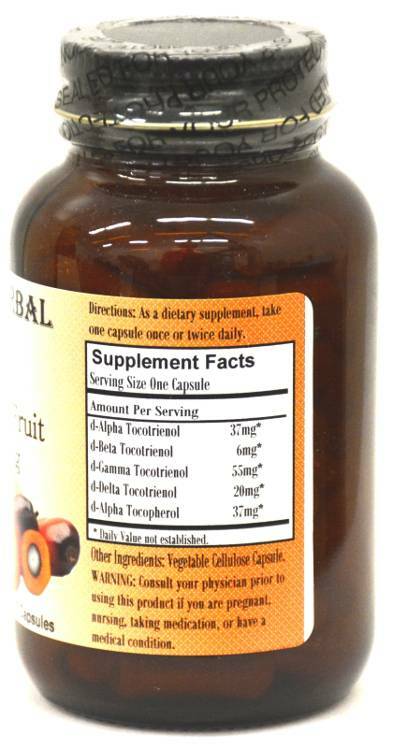 Barlowe's Herbal Elixirs now offers Toco-30 Tocotrienol Palm Fruit Extract. It is a full spectrum tocotrienol complex extracted from palm fruits (elaeis guineensis) which has been encapsulated in vegi-caps to make it more convenient to take. NOTE: Most of the gel-cap tocotrienol products contain only approximately 50mg of mixed Tocotrienols and approximately 15mg of d-Alpha Tocopherol. These capsules contain 118mg of mixed Tocotrienols and37mg of d-Alpha Tocopherol - substantially over twice as much as the majority of the gel-cap formulations. Bottled in Glass! No Stearates! No Fillers! No Junk! ***These vegetable-derived capsules (Vegan, Kosher and Halal certified) are filled on slow speed equipment and only pure, unadulterated herbal extract is contained in the capsules. There are no magnesium stearates, fillers, flow agents, gelatin, silicates, gluten, corn, wheat, rice, yeast, starch, titanium dioxide, artificial colors, artificial flavors or preservatives. Capsules produced with high speed equipment in herbal and dietary supplement "factories" generally contain several other ingredients, including powdered lubricants called STEARATES (which can greatly diminish an herb or supplement's absorption into the body). Check their labels! Barlowe also bottles his products in glass as he believes chemical vapors can vent from plastic containers and contaminate the contents and that glass is better for the environment. Toco-30 supports a strong cardiovascular system, hair health and optimal hormone production, and it is a water soluble powder for enhanced bio-availability. At the recommended dose (one 500mg capsule daily), Toco-30 will last 60 days. The tocotrienol complex utilized in this product comes from a top manufacturer - ExcelVite (formerly Carotech) - and it is their highest quality tocotrienol complex - a GMO free product called EVNolMax 30% (formerly TOCOMAX 30%). The certificate of analysis for this batch is shown above and one 500mg capsule provides the following: 37mg of d-Alpha Tocotrienol, 6 mg of d-Beta Tocotrienol, 55 mg of d-Gamma Tocotrienol, 20 mg of d-Delta Tocotrienol, 37 mg of d-Alpha Tocopherol along with 28 mg of plant Squalenes and Phytosterols. The tocotrienols in Toco-30 are powerful anti-oxidants which may have strong health benefits for the endocrine and cardiovascular systems and may help boost testosterone. Additionally, Toco-30 may help prevent hair loss and actually promote hair regrowth. In one study, all the participants supplemented with tocotrienol complex showed a positive result, with an average of a 42% increase in hair count after five months of treatment. Barlowe's Herbal Elixirs makes every effort to deliver the freshest and most potent tocotrienol complex to the customer possible. It should be noted that tocotrienols extracted from plants are basically unpreserved foods which are very susceptible to degradation from heat. 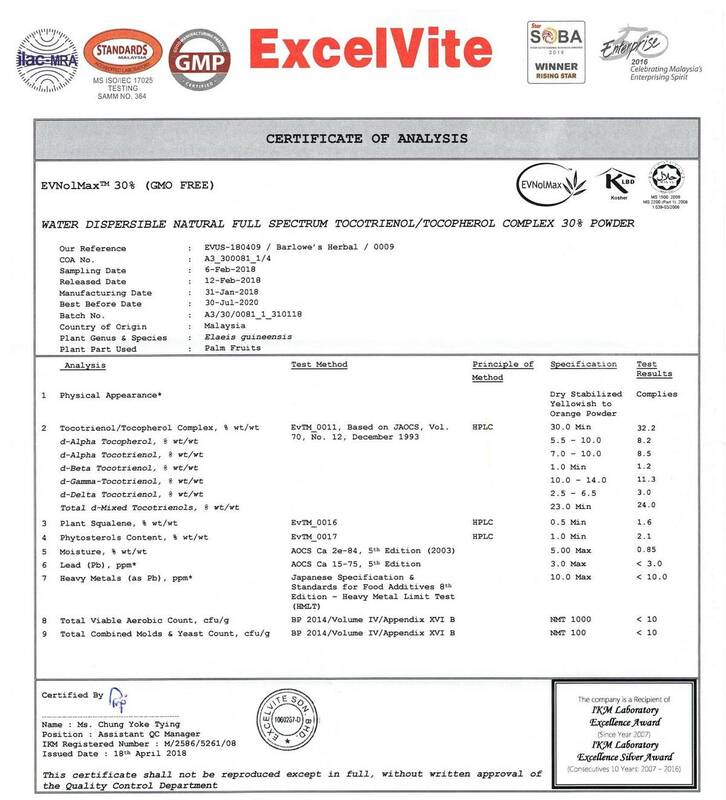 Barlowe's has its EVNolMax flown in directly from ExcelVite's GMP certified facility in Malaysia. Upon receipt, the bulk powder is immediately refrigerated. Only small amounts of this powder is encapsulated at any given time and when bottled, the bottles are kept refrigerated until shipped to the customer. You just cannot compare the tocotrienol gelcaps which are now prevalent on the market to Barlowe's product - as gelcaps are exposed to considerable heat during the gelcap encapsulation process and are not refrigerated for long periods of time as they go from manufacturer to distributor and finally to the customer. It should be noted at this point that, when unrefrigerated, the shelf life on natural tocotrienols is approximately six months and when refrigerated, it is approximately eighteen months. If you are not going to use this product right away, Barlowe's recommends that it be refrigerated or kept in an air conditioned room. Caution: Barlowe's uses only the finest quality and most potent Tocotrienol Extract from ExcelVite. Tocotrienol Extract is generally safe, but it is potent and should be utilized with care. The recommended dosage for most people is one capsule per day. This product is for dietary use. If unexpected side-effects occur, discontinue use immediately! The above statements have not been evaluated by the Food and Drug Administration (FDA). This product is not intended to diagnose, treat, cure, or prevent any disease. Directions For Use: Take one capsule daily with food. For some people, dosage may need to be increased as results and usage amounts vary based on body type and weight.